What can you expect from The Scripture Lady’s Preschool Bible Song Programs for kids at your church or school? * A clear and accurate presentation of the Bible for preschoolers’ understanding. * Easy to remember Bible songs accompanied by fun and appropriate moves. Book your Preschool program TODAY! 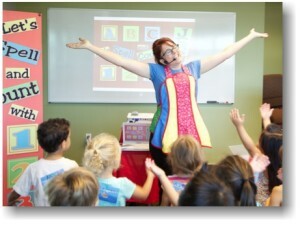 Performing for preschoolers is one of the Scripture Lady’s favorite things to do! Creating Bible song programs that are just right for little ones to learn about Jesus is a joy. It is never too early to begin sharing the love of Jesus with children and preschoolers are more than ready to hear God’s wonderful Word. The Scripture Lady delights to see little ones praising the name of Jesus through Bible songs and creative skits. Each presentation is filled with age appropriate songs for preschoolers. Every child will feel like a “Star of the Show” as they perform all of Scripture Lady’s toe-tapping moves. Currently there are over 52 Bible song programs just for preschoolers. All performances are perfect for Sunday school time, Chapel lessons for kids at your school or for your VBS (Vacation Bible School) or any other fun event you desire. The Scripture Lady has written over 52 Bible Song Programs for Preschoolers. Below is just a sample of these truth-filled, Jesus-centered programs. He has given each of them talents and special gifts. He has made them strong to serve Him. He has given them His love. This program also showcases Scripture Lady’s “Telephone Skit” – a favorite of preschool teachers and the “Who Does God Love?” heart. Your little ones will learn about patience from the lion, wisdom from the monkey, faithfulness from the fox and patience from the lion. God is all of those things too and wants your preschoolers to be just like Him! Get ready for a “roaring” good time with this program. You don’t want to miss it! Scripture Song verses and hymns include “Marching for Jesus(CEF)”, “Trust and Obey”, “I Waited”, “Monkey Song”, and “All Creatures of Our God and King”. “It’s Time to Give Thanks!” is the Scripture Lady’s newest holiday preschool program. This “timely” performance will remind your little ones to be thankful for all they have and for all that God does for them all day, every day! Your preschoolers will enjoy learning that God loves it when we are thankful. They will learn the story of the one sick man, out of 10 that Jesus healed, who came back to say, “Thank you!” And they will learn to thank God in the morning, throughout their day and before closing their eyes for the night. Songs will include “Enter His Gates”, “He is Good!”, “Ten Sick Men”, “As Long as I Live”, and “The Doxology”. 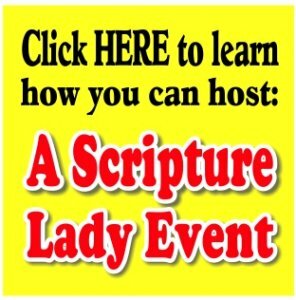 Let the Scripture Lady come and share her creative Bible song program all about the fruit of the Spirit that will introduce your preschoolers to all 9 of the fruit, but focus especially on the first three: love, joy, and peace. “Scripture Lady Sings Happy Birthday, Jesus!” will delight your little ones as they learn the true meaning of Christmas.Through colorful props, toe-tapping Christmas music and Bible verse songs, and giggle-full skits and games, your preschoolers will learn that God loves them so much that He sent His one and only Son to earth as a little baby to bring peace to the whole world. They will learn that Christmas is Jesus’ birthday and that they can give gifts to Jesus, such as their hands with which to do and make things that are grand! Let’s Put On the Armor of God! Does your preschooler have the belt of truth buckled around his or her waist? Do they have their sword of the Spirit and shield of faith? 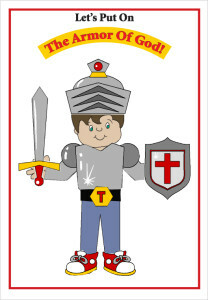 After this program, your little ones will be familiar with each piece of God’s amazing armor, as well as be familiar with their significance. Scripture Song verses and hymns include “The Battle is Not Yours”, “Right and True”, “Imitate God”, “Living and Active”, “Leaning on the Everlasting Arms”, and “I’m in the Lord’s Army”. Our Lord gave 2 important commandments: 1. Love the Lord your God with all your heart, soul, mind, and strength and 2. Love your neighbor as yourself. This program will help introduce these 2 important truths in very creative ways including the singing of Scripture Lady’s new song “Heart and Soul, Mind and Strength” and the magical object lesson that will bless one of your teachers with a yummy treat and God’s love for them. This program also showcases Scripture Lady’s fun Bible Games of “How Would You Feel If…?”, “Who Loves Whom?”, “Strengthen Me” and the magic trick “A Sweet Treat.” Your children will also learn the story of the Good Samaritan. Scripture Song verses and hymns include “Breathe In, Breathe Out”, “Fearfully and Wonderfully Made”, “L-O-V-I-N-G”, “Lamp and Light”, “Heart Free” and “Dance Like David”. Scripture Song verses and hymns include “Pray Morning Noon and Night”, “The Lord’s Prayer”,“Praise Him”, “Praise Him (CEF)”, “Monkey See, Monkey Do”, and “How to Pray”. Your preschoolers are learning so many new things including how to spell and count. Here is a fun Bible song program that points out some important numbers in the Bible along with with some very special words to learn how to spell, like JESUS! This program is a great example of how God’s Word can be brought into every area of our lives – even in counting and spelling. Your children will be introduced to the Ten Commandments, the Seven Days of Creation and the ABC’s of Animals God has made. Scripture Song verses and hymns include “ABCDEFG (CEF)”, “J-E-S-U-S (CEF)”, “OBEDIENCE (CEF)”, “The Creation Song (CEF)”, “The Baseball Song (CEF)”, “The 10 Commandments” and “the Gospel Fuzzies Song”.